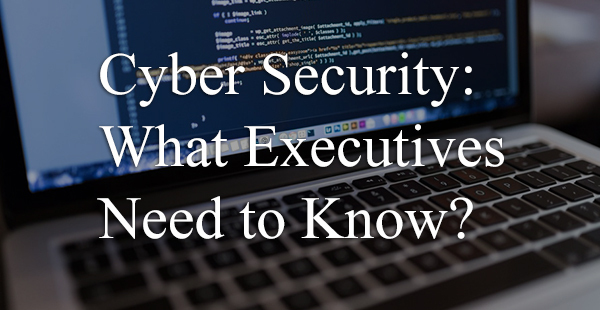 Cyber Security: What Executives Need to Know? It’s a complicated world for C-Suite Executives. Today’s executives face a business environment that is increasingly more complicated to read and adapt. Key challenges include navigating the right strategy for growth, acquiring the best talent, and harnessing the power of big data and digitization paint a competitive landscape. As Executives observe the global business environment, one concern continues to grow in magnitude among all others. 61% of CEO’s interviewed in the PWC 2016 CEO Survey mentioned that Cyber Threats are at or near the top of business concerns. We asked Phil Ferraro, distinguished CISO in the public and private sector, to share some of the insights from his forthcoming book, CyberSecurity: Everything an Executive Needs to Know with our clients. Phil reinforces the concerns of the Survey; Cyber Threats are a risk to business and IT. The first thing to understand, this is happening now, cybercrime is perpetrated on large and small companies. Nortel Networks, a former Fortune 500 manufacturer of telephone equipment, was forced into bankruptcy due to a breach of the company’s most sensitive data. For five years, corporate secrets and intellectual property were sent undetected to an IP address in China. This type of breach, Advanced Persistent Threat (APT), is becoming more prevalent due to state-sponsored hacking or cyber-terrorism. Nortel’s technology was duplicated, commercialized and subsequently positioned against them in their markets. In January 2000, Nortel’s stock hit a high of $124, and dropped to $0.39 by 2009 when they sought bankruptcy protection wiping out careers and retirement accounts. 229 – Average number of days a hacker is inside a network before detection. Down from 243 days in 2012, but that number astonishes me. 52% of attacks initiated by hackers, or hacktivists. 40% of attacks come from malware. The threat landscape has changed dramatically. Executives worry about how a predator can blackmail, greenmail, or steal vital information like health records (Anthem), credit card information (Home Depot and Target), or the crown jewels as in the case of Nortel. This can happen while you are sitting at your desk or working on your mobile device. A cyber security breach can put an organization out of business, or at the very least cost it tens, if not hundreds, of millions of dollars. Moreover, that may pale in comparison to the significant damage to valuation, brand, litigation and reputation. The Board of Directors and the Executive Leaders of the organization are responsible for the success of the business. As such, they should anticipate and be prepared for any future event that could significantly impact the organization. One of those events is a cyber-security breach. The Board of Directors and C-Suite Executives face an enormous challenge and need a plan in place to prevent these catastrophes and know how to respond if they occur. Look at our Feature Article on Cyber Security in this article for some specific steps to consider. The goal of Phil’s book is to help you gain an in-depth understanding of each of these significant areas while learning what steps you, as a leader, can take to prepare properly your organization to face today’s constantly evolving threat landscape. If you are interested in a free copy of Phil’s book, please let me know. We have a limited number of books available on a first request basis and I would be happy to send a copy to you. Contact Kent Lamb at 972-377-3525 or email me at kent@titanconsulting.net. You can also contact your Titan Sales Director as well.